The USAID supported Feed the Future Kenya Accelerated Value Chain Development (AVCD) program organized a successful national conference on the 26th and 27 April in Nairobi. Addressing over 400 participants at the conference, His Excellency President Uhuru Kenyatta applauded the project for contributing to his government’s three of four big goals: food security, healthcare and manufacturing. He was accompanied by Mwangi Kiunjuri, Cabinet Secretary, Ministry of Agriculture and Irrigation. 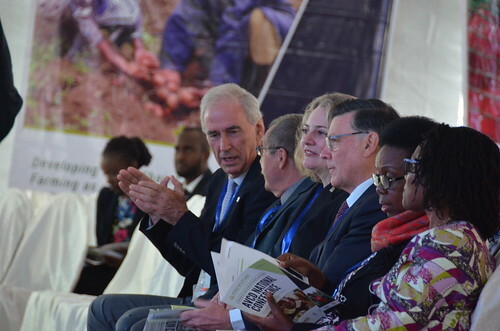 The US Ambassador to Kenya Robert Godec was present at the event together with other dignitaries. Since September 2015, a consortium of CGIAR centres—International Livestock Research Institute (ILRI), International Potato Center (CIP) and International Crops Research Institute for the Semi-Arid Tropics (ICRISAT) have implemented the AVCD project covering 21 counties across Kenya. The program, whose first phase is expected to end by 30 September 2018, has sought to widely apply technologies and innovations for selected value chains to competitively and sustainably increase productivity while contributing to inclusive agricultural growth, nutrition and food security in the country. The two-day national conference aimed to share the lessons learnt, and develop sustainability and exit strategies. Participants included farmers (beneficiaries), county government officials, implementing partners, development partners and national government officials. Members of the ILRI and CIP board at the conference. Second right is CIP board member Her Excellency Rhoda Tumusiime Peace. “This project, working from the lab to the spoon, uses a whole value chain approach to benefit 317,000 Kenyan food producers,” noted Romano Kiome, chief of party of AVCD whose five value chains include potato, sweetpotato, dairy, livestock and drought tolerant crops. CIP has led the root crops (potato and sweetpotato) component that aims to improve food security, nutrition and incomes of 100,000 smallholder households in Kenya over three years. The potato value chain has focused on seed system development with a business-minded approach, supporting private sector investment in seed production, increasing potato productivity and enabling market opportunities. It has contributed to improved access to quality seed, food security, increased income and dissemination of better varieties and best potato practices in Elgeyo-Marakwet, Meru, Nandi and Uasin Gishu counties. In total, 30,500 farming households have been reached with quality seed, improved technologies and training, and 19 firms are being supported to improve business performance. Supporting 200 seed multipliers to develop into seed businesses and improve farmer availability to quality seed resulted in reducing the distance travelled by farmers to access seed potato from 110 km to 2 km. “After their second to third season of seed production and sales, the seed multipliers collectively sold 392 tonnes of quality seed potato valued at US$157,000 to 2,300 potato farmers,” said Monica Parker who leads the potato value chain. The business approach to seed production earned seed multipliers an average gross margin of US $3,000/ha. Encouraged by the high profitability of the seed potato business, seed multipliers have collectively invested US $71,300 US in their seed businesses, which includes 123 tonnes of seed storage. Another promising innovation is the integration of apical cuttings into the potato seed system. This will complement current systems to increase the availability of certified seed. So far the private sector is investing in the technology to produce cuttings in the screenhouse and produce tubers from cuttings in the field. Two private sector partners – Genetic Technologies International Limited and Stokman Rozen Kenya – have distributed 330,000 cuttings to farmers producing seed potato. The Kenya Plant Health Inspectorate Service (KEPHIS), regulating seed certification, has endorsed cuttings and is integrating the technology into seed potato certification protocol currently being finalized. Once the modified protocol is approved by KEPHIS, cuttings will be eligible for seed merchants to use as starter material to produce certified seed. “We are pleased with the current pace that this technology (apical cuttings) has been introduced, trialled and is fast gaining acceptance by seed producers,” says Simon Ndirangu of Stokman Rozen Kenya. Potato farmers have been trained on good agronomy, which has led to the near doubling of gross margins per hectare: from a baseline of US $ 720/ha to US $ 1,326/ha. Becoming knowledgeable of good agronomy for potato and observing the benefits of using quality seed, farmers are investing in quality seed, purchasing it from their local seed multipliers. “I bought seed from Isaiah Kemei (seed multiplier) in October 2017 and I am impressed by the uniform crop and fairly good yields despite very low rainfall received during the October – December rainy season. Initially, I thought the cost of seed from Isaiah was very high (~US $20 per 50-kilo bag) but now I am glad I bought the quality seed,” says Abraham Choge, a potato farmer in Uasin Gishu County. Business skills training and business plan development are in progress for five potato cooperatives and six youth groups. The training has enabled the groups to learn basic skills on visioning, marketing, cooperative/youth group as a business entity, and profit analysis. The cooperatives and youth groups now appreciate the business-approach to agriculture and are finalizing business plans drafted with program support. Initially, the humble orange-fleshed sweetpotato (OFSP) was viewed as a woman’s crop to be grown on small holdings, and its consumption was limited to households, with preparation methods consisting mainly of boiling the tubers. There was also no large-scale production of the vines – the planting materials – since there was no commercial demand. Today, the story is vastly different. More than 10 hectares are under production of the OFSP vines, with the potential to plant up to 150 hectares of sweetpotato. Farmers are growing OFSP in the main planting season. There is a diversity of delicious and nutritious OFSP-derived food products on the market, and the OFSP is viewed as a cash crop in four counties: Homa Bay, Migori, Busia and Bungoma. To increase the availability of quality planting material, the program worked with the plant health regulator, KEPHIS, to supply 41 vine multipliers with certified tissue culture cuttings; with these vine multipliers producing and selling vines worth US$ 49,952 to sweet potato farmers. Through the program’s support, two puree (mashed OFSP) processors have emerged: Organi Ltd and Safe Produce Solutions Ltd. The puree is the intermediate raw material used in the production of OFSP-derived baked foods. These processors, in turn, have been linked to two major retailers: Tusky’s and Naivas Supermarkets that have multiple stores in various towns in Kenya. The OFSP value chain has grown in vibrancy and profitability in the last two years: farmers have been linked to markets and sold US $ 199,892 worth of roots; with this figure projected to triple in 2018, to nearly US $ 600,000. Supply contracts signed upfront with end buyers, have increased farmers’ confidence in the value chain’s commercial value. For instance, the program connected more than 1,000 growers to a puree processor (Safe Produce Solutions Ltd). Farmers are paid within two weeks of supplying their roots via mobile money, and this encourages them to invest in the production of quality sweet potato. Other joint investments with the private sector have been in two storage facilities – the first of their kind in Kenya – with a 20-ton capacity to ensure a year-round supply of quality OFSP roots. “With up to 60% substitution of wheat flour for the major confectionery products, these products will be produced at a fraction of their current price, increase the gross margin of the processors and make the products and the value chain quite attractive. The potential is huge, and we can see youth being attracted to this value chain.” Substitution of wheat flour for OFSP puree will also save the country forex exchange since about 80% of wheat used in Kenya is imported. There are major buy-in and business interest from leading supermarket chains (Tusky’s and Naivas) and consumers alike; the program’s OFSP root producers and puree processors are currently unable to meet the supermarkets’ demand. With 45 stores countrywide, Tusky’s plans to stock OFSP bakery products in all its stores. Currently, its OFSP bread sells out fast: 3,000 loaves per day from 14 of these outlets daily. Naivas, on its part, has 39 stores, with similar projections. Combined, the revenue from the OFSP commercial products from the four partners exceeds US $ 120,000 annually. “Orange-fleshed sweetpotato is useful for achieving two main goals: it has a high nutritive content of beta-carotene and huge prospects of food security for households. Production of puree provides a great opportunity – from a sustainability perspective – to grow smallholders’ incomes consistently and steadily as it provides a diverse market outlet: to bakeries, hotels, ice-cream parlours and even home consumers,” says Grace Nyaa of Safe Produce solution. As phase one of the AVCD project comes to an end, participants at the conference were impressed by the achievements of the project and hoped innovations could be scaled out. Ambassador Godec launched a planned 11.5 Billion KES ($115 million) Feed the Future Kenya Country Plan under the U.S. Global Food Security Strategy which aims to reduce poverty and improve the ability of local farmers and pastoralists to cope with economic shocks such as drought. Kenya is among the 12 countries selected to champion the U.S. Global Food Security Strategy.